Always believe in faeries. I believe that most kids grew up on fairytales. They, myself included, grew up believing that there were faeries in gardens, mermaids in the sea, and dragons who once captured beautiful queens. Being raised like that was something I would not change for all of the world. It was a big part of my young life and mind. My Granny was the queen of the faeries who would read me stories about our kind, either about flower fairies or faeries like her that took form as humans and lived normal lives. I believed that when I was older my Granny would step off her throne and I would take it and become the fairy queen. Without that type of upbringing, I do not think my images would be like they are now. They have that sort of fairytale feel, the feeling of a little bit of magic and a bit of fantasy. But they can also be darker. I remember around Halloween time my Granny, who loved to decorate for every season and holiday, would put out some Halloween books on her coffee table. There were many little kids books, which I enjoyed since I was under the age of 8, but there was this one, a bigger one, probably around 300-400 pages with very few pictures. I can remember this book as clear as day. The pictures were quite dark and scary, with skeletons and gallows (which even at that age I knew what they did), grave yards and evil werewolves. I was almost afraid of the book. But it showed me something very important. It showed me that even with fairy tales and magical creatures, there was a place for all the nasties and monsters. It showed me that even the happy beautiful fairytales had evil creatures. Without these villains what kind of fairy tale would we have? Little red riding hood would have picked hundreds of flowers, eaten all the food, and run home when it grew dark without the wolf. Without the evil in the story of Hansel and Gretal, they would have just been a normal family. If there was no good vs. evil, there would be no story to tell. In my fine art photography, I try to capture both the light and dark sides of my fairytales. 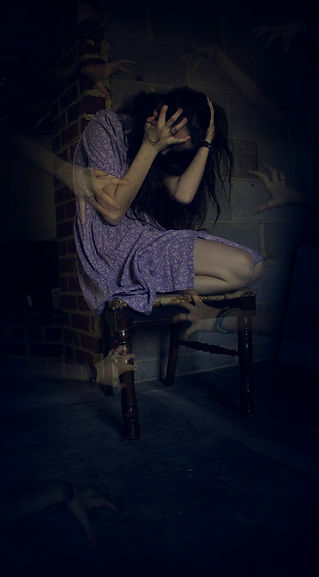 Stories of how a girl has voices and nightmarish things inside her head that she can not get out. 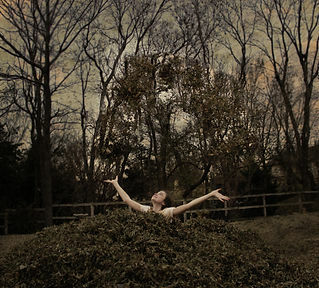 A story about a girl who plays in the leaves not a care in the world. 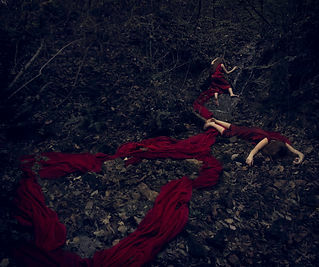 Now I must admit my fairy tales might be a bit darker than most, two bodies making the river red so that the forest can live. 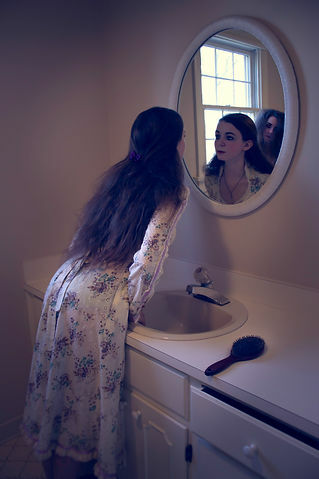 A girl looking into the mirror with a demon like creature staring at her through it. But I believe that even the sad, darker, creepier stories are as important as the light happy ones. Even though we all want those happy endings there needs to be some villains and threats in there to make that happily ever after worth having. We are all part of our own fairy tale, and like each and every one of us, they are different. I might be the fairy queen in mine (or at least hopefully), but maybe you are the handsome Elvin prince, or the nice elderly Gnome. You might be nobility, or a beggar or even the captain of a pirate ship (That would be my sister). Just like we are all different characters we are all at different parts of our stories. Maybe you are facing head on with that evil villain or maybe your just now putting on your horses saddle so you can start your quest. Wherever you are at in your story know that you are in your very own fairy tale, and you have it better than Cinderella, or Peter Pan or even Thumbalina. The advantage you have over them is the fact that you know you are in a story, which makes you both the main character and the author. Your story has everything from evil stepsisters to fairy godmothers, thorny bushes to seven dwarfs, an annoying guard to heart throb princes. And some things we cannot edit out. Like how a dragon swoops in a steals you away or that evil mother who just really wants you dead. But you can control what you do and how it effects your story world. A lot of people do not realize that if they do not like their life there is nothing in their way from changing it. Sure you might not be making enough money to buy that car that would make your life so much better, but that is not stopping you from having a good life. Changing the little things adds up to changing the big things. Like every good fairy tale there will be things you cannot move or write around. Those gates, towers, beasts, and step mothers just won’t move and it seems like your life went from bad to worse. And like every good story the hero presses through, and you come to see the light as you emerge from the shadow of the dark castle. During those dark times you will learn lesson that you most likely never even knew you needed. You will learn more about yourself then sitting in your castle all day long could ever teach you. These moments will make you stand a bit straighter and make your sword a bit sharper. With each challenge you, just like the fairy tale characters, get closer and closer to that happily ever after, you just have to keep going. The bad things, monsters, banshees, walking skeletons, all have a place in our life. They might not all look like a flesh-eating werewolf and be as deadly, but they can sure feel like it. Even with all the evil around us and inside us nothing will compare to the light after you press through the dark. Challenge the way you see the darkness and the darkness will no longer seem so challenging. Look for the lighter shadows and you will not see the darker ones. Face the fight with a smile and a ‘Bring It On!’ and it might not seem as bad as you first thought. Not all fairy tale moments are light and happy and the sooner we realize this the sooner we will understand what we have to do to get it to be light and happy. How will you see the rising darkness? A deadly threat? Or a test to see how you can make yourself better?